Knowing how much sleep is enough sleep can be a tricky one to gauge. After all, the only certain way to not be feeling tired for prolonged periods of the day, is to sleep until you wake up naturally. While this concept is great – most of us, after all, love a lie-in – unfortunately, in the real world, this simply doesn’t work. Thus, the argument is, it’s probably better to sleep for 4.5 hours (three cycles), than it is to wake up after 5.5 hours, which would interrupt the cycle, leaving you feeling like you’ve scarcely slept at all. Whilst I cannot vouch for the research behind it, the site has nearly 100,000 Facebook likes, suggesting there is indeed some truth behind it. One particular individual – developer ambiate – sleeps for 12-14 hours a day – a huge amount by anybody’s reckoning. 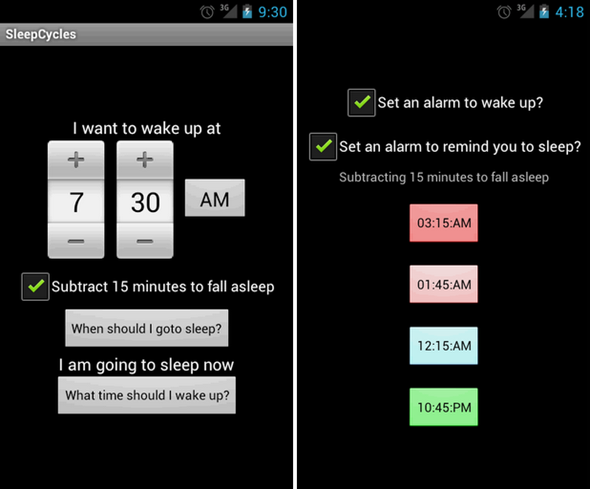 Having enjoyed some relief with the sleepyti.me calculator, he has now created an Android app which carries the same idea. 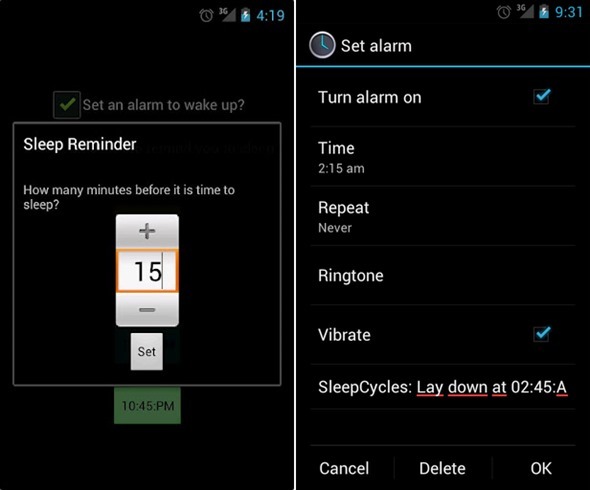 Not to get confused with Sleep Cycle – a popular alarm clock for iOS that analyzes your sleep patterns and wakes you in the lightest sleep phase – Sleep Cycles makes sure you wake up in between cycles, meaning no matter how little a window of opportunity you have in which to sleep, you maximize the benefits. By using the proper sleep cycle at night, you will feel more refreshed when you wake up. Your body is typically already in a half awake state during a REM cycle. This application just calculates when these typically occur! Free to download, early adopters have been seemingly pleased with the results, and it currently has a respectable 4 star rating. So download it, give it a go for the next couple of nights, and be sure to let us know if it works for you via the usual mediums below! Today’s science has lot attraction in different uses. There are lot option are available in it. Such a result we find lot of help from this smartphones. So i think today it give us lot option to wake up in the just time.